PHILADELPHIA – His resume speaks for itself. A college coach – both as an assistant and head – for more than a decade. An assistant coach for the Philadelphia 76ers since 2013, an era that included a complete rebuild of an organization going nowhere but now being considered among the NBA’s elite. 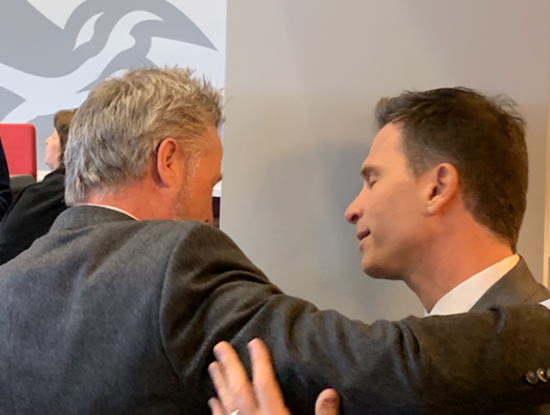 So when St. Joseph’s University announced that its new men’s basketball coach would be Billy Lange, no one could criticize the choice. 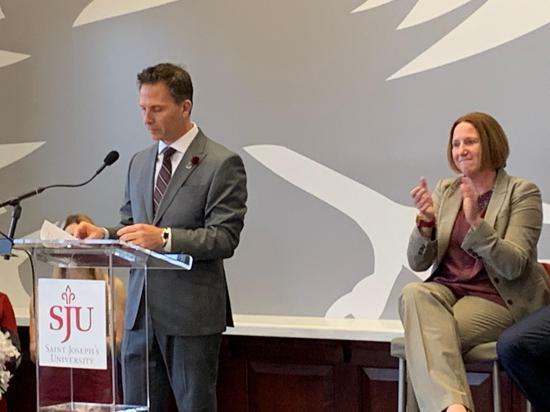 “Within 10 minutes in that interview, I knew this was our next head coach,” said SJU’s first-year athletic director Jill Bodensteiner. “I had done all my research. I had never met the guy. I had heard a lot about him. I had done some reference checks and he absolutely blew me away. 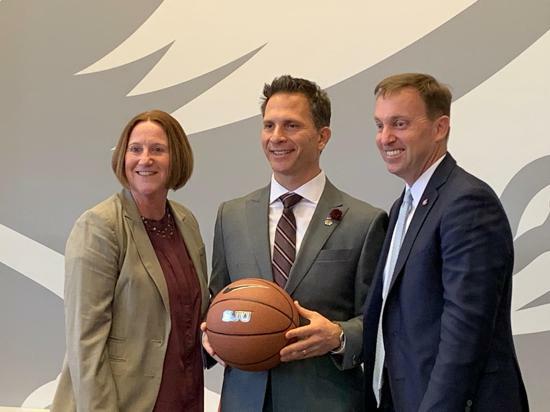 On Thursday afternoon inside the school’s Hall of Fame room, Bodensteiner and school president Dr. Mark Reed both formally introduced Lange as St. Joe’s 15th head coach in its 110-year history. With his wife Alicia, sons Will, Matt, Jake, and Mark, parents, brother, mentors such as 76ers coach Brett Brown and former La Salle and Rowan University coach John Giannini – Lange’s college coach at Rowan – present, Lange provided some of his insights both before and after accepting the position. “All the jobs I’ve been involved with have been great jobs,” said Lange. “With the Philadelphia 76ers, I can’t say enough about my time there. I miss those guys. “You start wrapping your head, though, around what is an epic opportunity. 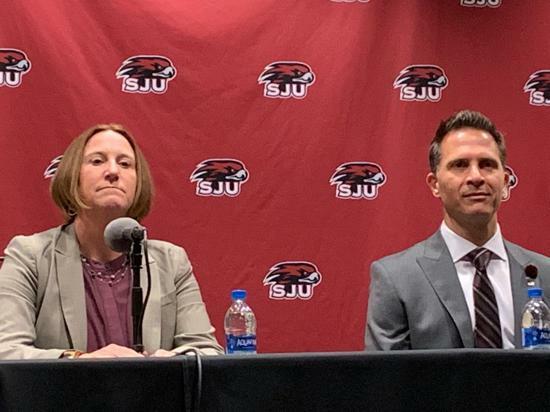 You get a call that says that St. Joseph’s would like to meet with you and you start thinking about being the head coach at St. Joe’s and I wanted to walk in there and meet with Dr. Reed and Jill. You’re talking about the president and the athletic director at this great institution, so I better be prepared. Lange reminisced about an immediate whirlwind of emotion – should he keep his great job with an NBA team near where he grew up in Haddon Heights, N.J., or should he inherit a basketball program at an uber-popular, much-loved Big Five university with high expectations to return to the national spotlight? After returning to a place of mental and emotional calm, Lange knew he had to make a decision, and soon. The 2019-20 edition of Hawks basketball teeters in limbo. Because a new coach has taken over, every current player is allowed to test the transfer waters without the need to sit out a year. While there have been rumors about who will stay or who will go, it’s way too early to predict. For now, Lange is offering his philosophies of both life and basketball. “College is a time of great growth,” said Lange. “Young, eager, and ambitious hearts and minds come to this university filled with hope. They are ‘dream chasers,’ if you will. 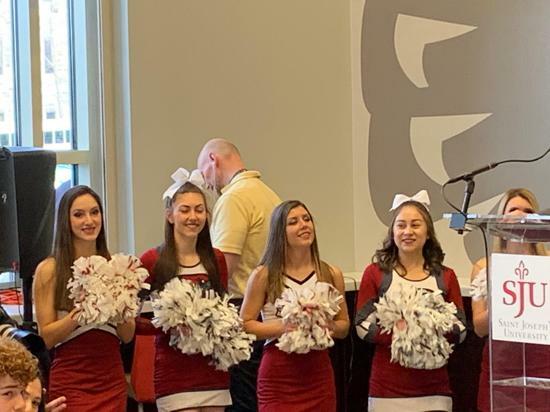 Any student athlete who comes to play basketball in the great city of Philadelphia in a major conference like the Atlantic 10, and to a program like St. Joe’s basketball, which has had countless great players – too many to name – should have high basketball aspirations. As for his personal journey, Lange is beyond grateful. “Human beings do not ‘replace’ human beings,” said Lange. “What has preceded my arrival here is decades of relationships, mentorships, servant hood, influence, and an eternal impact, which I will strive daily to maintain and continue.